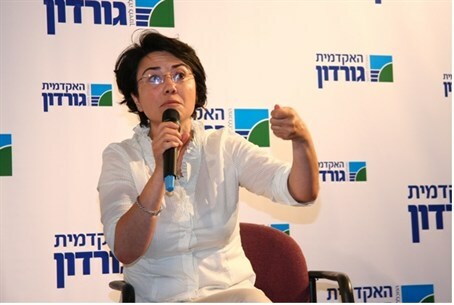 MK Hanin Zoabi: Israel trying to hide the murders of Arabs it committed; Bulgaria attack because of the "occupation." Arab MK Hanin Zoabi (Balad), notorious for her attacks on the State of Israel despite her being a member of its parliament, is at it again. Zoabi, who appeared in a public discussion forum at the Gordon College of Education in Haifa on Thursday, said that just as Israel demands to hold a minute of silence in memory of the 11 athletes who were murdered at the 1972 Munich Olympics, there should also be a minute of silence for Palestinian Authority Arabs who were killed by Israel. Last December, a photo was published which shows Zoabi rubbing elbows with well-known Hamas figures. The photo, recovered with a cache of intelligence data, shows Zoabi alongside four known Hamas members, two of whom have served time in Israeli prisons for alleged involvement in a terror organization. She has been criticized by many fellow MKs for her anti-Israel actions. MK Danny Danon (Likud) recently filed a request with the Central Elections Committee to disqualify Zoabi from running in the next election. Last year, Arabs in Haifa University invited Zoabi to speak on campus for “Nakba Day”. That event was eventually cancelled by the university at the last moment.